The absolute best recipe (after testing hundreds) for buttermilk pancakes. In fact, these are melt in your mouth buttermilk pancakes! It’s finally here!!!! 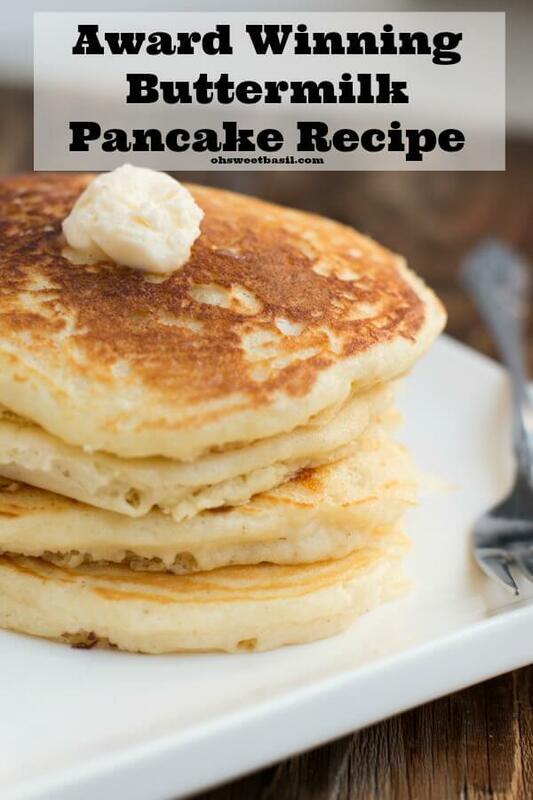 After testing, and testing, and testing all sorts of buttermilk pancake recipe we’ve finally come up with Cade and the girls say is finally the award winning, melt in your mouth buttermilk pancake recipe!! Woop there it is! This recipe for buttermilk pancakes truly took us months of testing but I just know you’ll love it too so it was worth every disaster and every re-do. 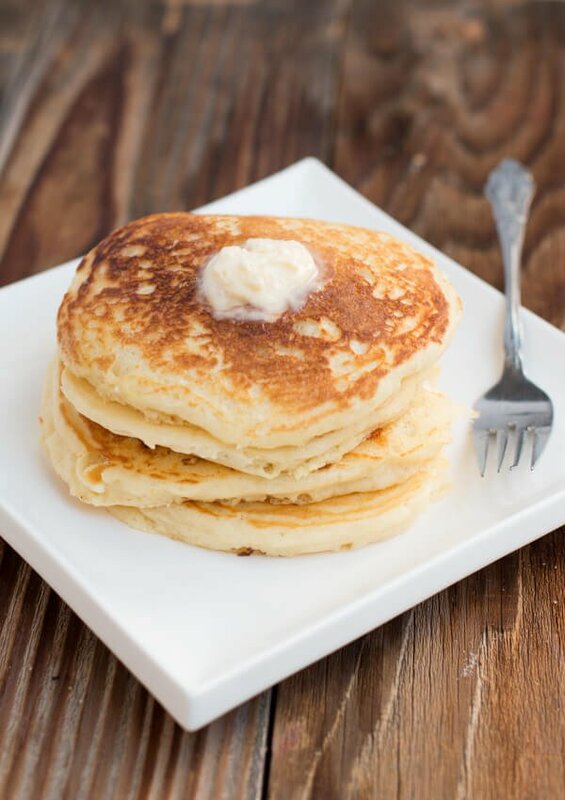 Make sure you try these melt in your mouth buttermilk pancakes with our Buttermilk Syrup, ridiculously amazing and delicious! How do You Make Pancakes From Scratch? Making pancakes from scratch only takes basic ingredients, flour, eggs, milk, leavener and little to no sugar. We tried all sorts of different techniques like, adding oil instead of butter, sifted flour or regular flour, egg whites beaten to stiff peaks, an extra egg yolk, whisking versus stirring, baking powder, both baking powder and baking soda and bla bla bla. Everyone swears by the egg white method, but we actually found that not only did it take too much time, but the pancakes were surprisingly too airy for us. We wanted a light pancake but we still wanted it to melt in our mouths which means we had to ditch the egg white and change up our baking soda and baking powder method. Why do My Pancakes Come Out Flat? 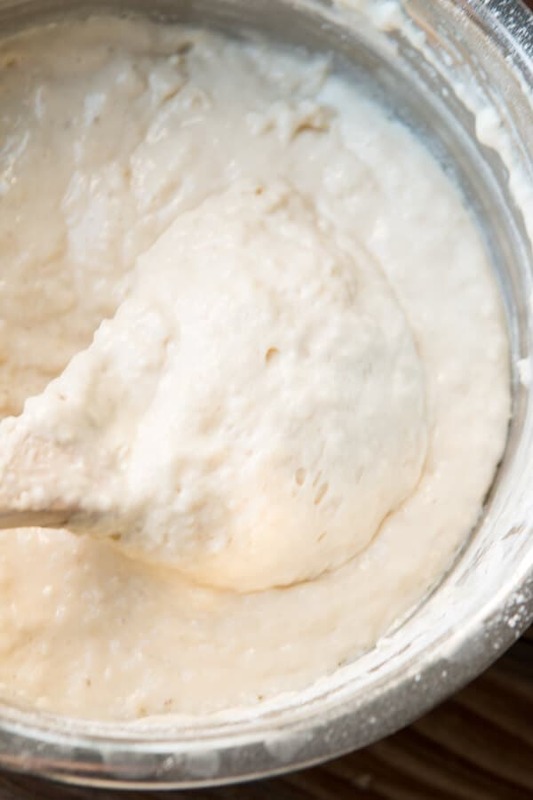 Over-mixing pancake batter develops the gluten that will make the pancakes rubbery and tough. For light, fluffy pancakes, you want to mix just until the batter comes together—it’s okay if there are still some lumps of flour. 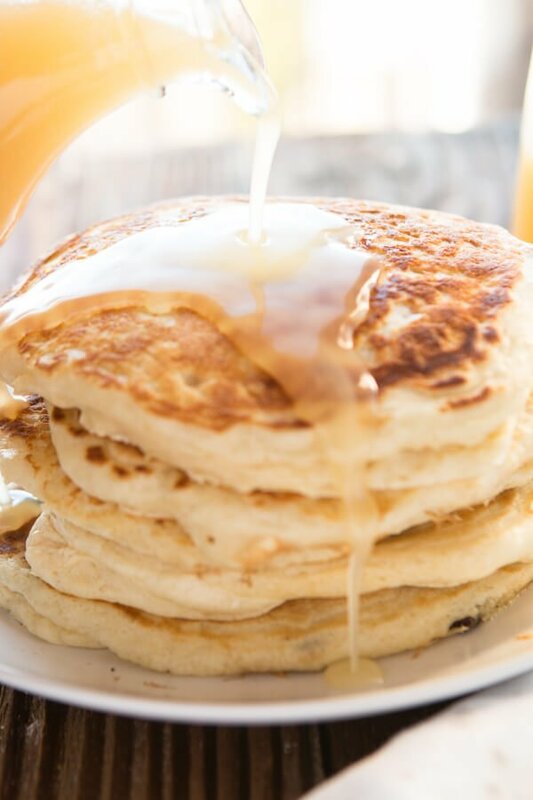 Fat (melted butter) makes the pancakes rich and moist. We also added a little melted butter at the end because it really created a nice texture and barely buttery taste. And now I want pancakes again. This batter should be very, very thick. That means you made it right. I guess it depends on what kind of pancakes you’re making, but we prefer thick buttermilk as it brings about a lighter, fluffier and tastier pancake. I know a lot of you, much like ourselves, don’t keep buttermilk on hand so you may be wondering how to substitute buttermilk in pancakes, but this is one of the few times I’ll plead with you to use the real stuff. 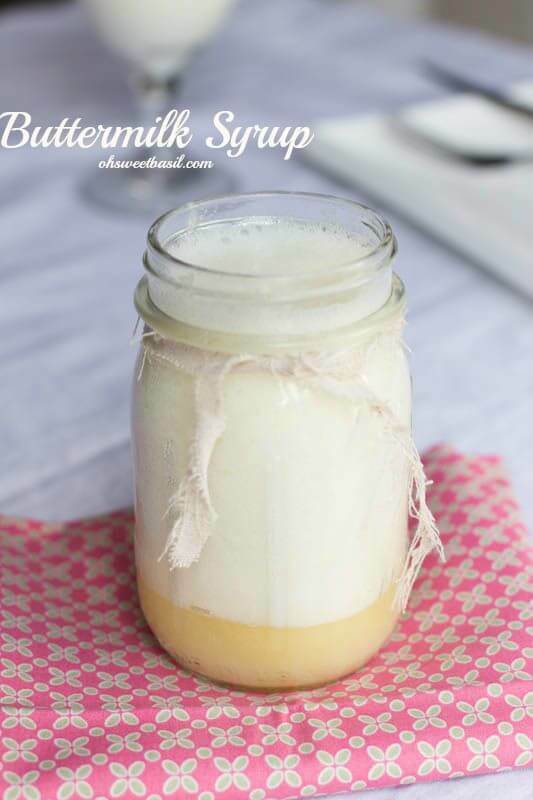 Buttermilk substitute is generally about 1 cup of milk to 1 teaspoon of vinegar or lemon juice, however while that gives it a similar tang it doesn’t make it that thick and creamy liquid that you need so if you can, stick with the buttermilk. So here’s the question, how do you know, when are pancakes done? Well, it takes practice, but definitely start with the bubbles popping on the batter side of the pancakes, at which point you should flip the pancakes. After that, I gently press on the top or gently push the top from side to side and watch for batter to press out or the middle to sink in. If that doesn’t happen then the pancake should be done! 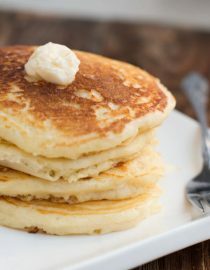 These melt in your mouth buttermilk pancakes are truly the best pancakes from scratch, heck even pancakes from the bag recipe I’ve ever had. 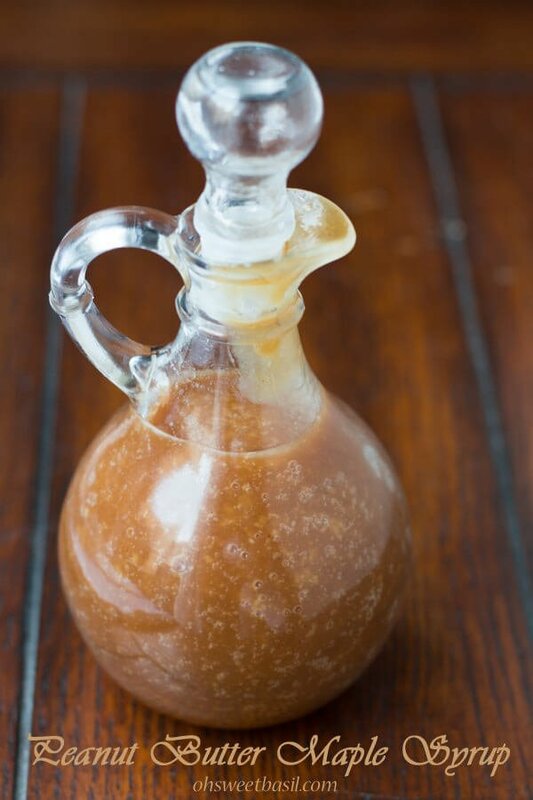 This is our hands down, number one most favorite syrup recipe ever! Have you ever mixed peanut butter with maple syrup? It is fantastic!! Or if you are in the mood for something other than pancakes, try this French toast! Another one of our favorite breakfast for dinner options is poached eggs! Preheat a griddle to medium heat. In a medium bowl, whisk together the salt, baking powder, baking soda, flour and sugar. In a separate bowl, whisk together the eggs and buttermilk. Drizzle in the butter as you continue to whisk. Switch to a wooden spoon and make a well in the middle of the dry ingredients. Pour in the wet ingredients and stir until almost completely combined. Please remember, the more you stir pancakes the more flat and tough they will be so please mix until a few streaks of flour are remaining. Butter the griddle and scoop 1/3 cup of batter and cook until bubbles begin to form, flip and cook until golden.